How to Design the Ultimate Backyard Patio — KTJ Design Co.
After we finished designing our clients’ home earlier last year, we were more than excited when they asked us to deck out their newly landscaped backyard. 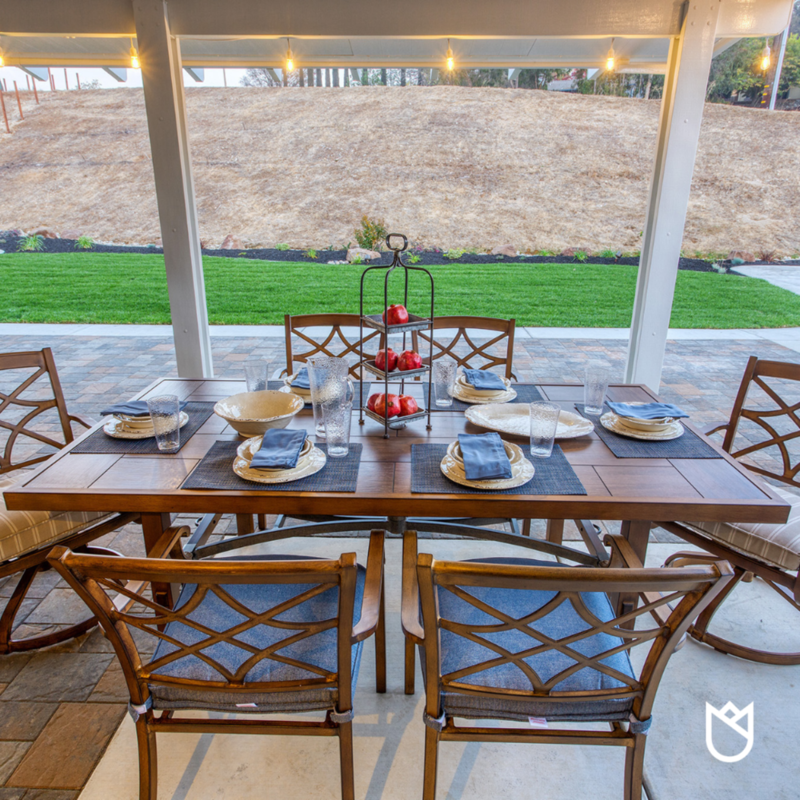 Although it is cold outside right now, if you’re planning to spend summer hours in your yard, this is the best time to start thinking about getting your outdoors space all decked out (pun intended). The key to making a dream outdoor space is to always include the same elements outdoors as you would indoors. This means sofa, chairs, tables, lighting, rugs, and more should be on your list of outdoor living essentials. Our clients had a beautiful patio cover installed, which greatly expanded their indoor/outdoor space. They also have large sliding glass doors, making it easy to remove the barrier from patio to living room. To ease the transition between indoor and outdoor, we placed a lovely rug on the paver patio floor. We also selected these outdoor ceiling fans and added strings of twinkling lights along the ceiling of the pavilion. Because the patio is a seamless extension of this home’s stylish interior, we used the same theme and color palette as the interior, from durable Sunbrella fabric in a lovely indigo and tan to the fun paisley print. The tan outdoor rug and large blue ceramic pots boost visual appeal and enhance that color palette. Using a living room style furniture placement helps define this outdoor space. Because our clients have a large family and entertain often, we cleverly offered several seating options and created conversation hubs with a sofa and loveseat arrangement, chaise lounges, and a large dining table. We also added decorative accessories such as sculptures, candles, and bowls. Think of different elements such as wood or metals to mix it up as we did with the hutch. Are you itching to get into the warm sun? We can help you plan your outdoor escape ahead of time so that you can enjoy it as soon as spring arrives. Schedule a discovery call to find out how we can work together.